the CGS system of units (centimeter - gram - second). In the following text, you will find the definitions and conversion factors of CGS units in mechanics and electromagnetism. We have also prepared the table with commonly used physical constants in CGS units compared to SI units. In mechanics, the definitions of the CGS system and of the MKS system are very similar, because they differ only in the scale of two base units. The MKS units use meters 1 m, kilograms 1 kg and seconds 1 s, and the CGS units use centimeters 1 cm = 0.01 m, grams 1 g = 0.001 kg and seconds 1 s. In the table below, we have listed some CGS units with special names and their conversion factors to the MKS units. If you want to express another physical quantity in CGS units system, you just need to use an appropriate formula. For example, since the units of power in the metric system are joules per second J/s or watts W, the units of power in the CGS units are ergs per second erg/s and 1 erg/s = 10⁻⁷ J/s = 10⁻⁷ W.
1 in the Gaussian CGS system. You can see that some CGS subsystems can simplify physical formulas. That's why it is so popular in many areas where there are a lot of theoretical calculations involving electromagnetism equations. 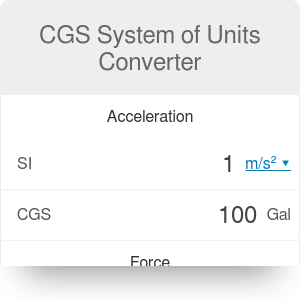 In this CGS system of units converter, you can find relations between electromagnetic units of the International System of Units and the Gaussian CGS system. We have listed these with special names in the table below. Differences between the metric system units and CGS units obviously lead to a change in the value of physical constants. You will find some of them in the table below. CGS System of Units Converter can be embedded on your website to enrich the content you wrote and make it easier for your visitors to understand your message.